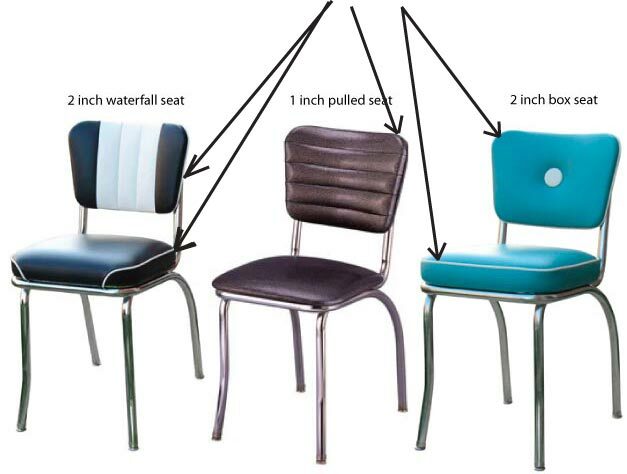 When getting high end upholstery furniture such as our retro diner chairs, most companies sew a layer of piping or welting between each panel. As you can see below, the arrows point to a few different chairs and show where we put piping. You can get the piping in the same color as your main uphosltery color or you can get it in a contrasting color like the black and white chair and the blue and white chair. The piping is made one at a time from scratch so you can get it in absolutely any color. If you need more help or if you are having trouble figuring out what to order, please give us a call.